Our goal is to be a resource that school districts can rely on to continue to improve their transportation systems. Installation of crossing arms and strobe lights years prior to state regulation. Installation of video cameras on school buses. Installation of electronic “Child CheckMate” systems in every bus in our fleet. An electronic alarm requires each bus driver to walk through his or her bus at the end of each route. Failure to do so results in activation of the bus’s horns and lights, to ensure that no child is left on the bus. “School Bus Safety Classes” offered at no charge to our young riders in elementary grades. Classes are typically held during National School Bus Safety Week in October with the help of our drivers, trainers and office staff. Tyler VersaTrans routing software implemented at our Menomonee Falls, West Bend, Plymouth and most recently, Fond du Lac terminal. GPS technology for our fleet began implementation in the 2011-12 school year and is expanding at every location. As of now, 25% of our fleet has GPS technology installed. 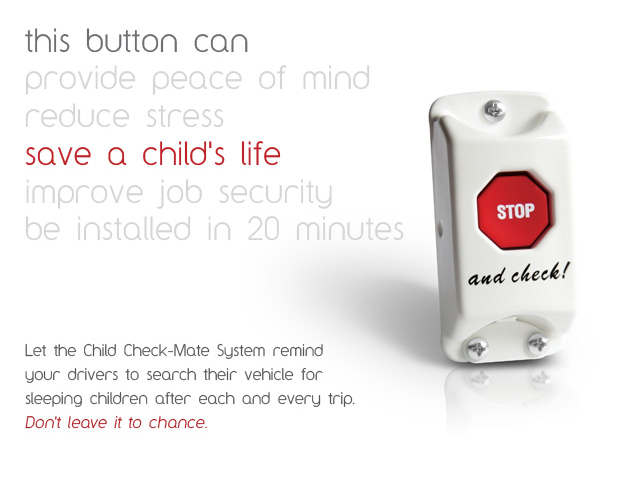 The Child Check-Mate System has been used on school buses across the nation since 1992. A thorough new-driver training program, including comprehensive classroom, video and behind-the-wheel instruction covering all aspects of student transportation. Clear and concise policies and procedures provided in the driver handbook, verbally, through newsletters, safety meetings, and postings.Regular surveys of surrounding school districts to compare driver pay rates in order to retain a quality pool of school bus drivers. Attendance bonuses, holiday pay, service and safety recognition, and a 401(k) plan are part of the benefits we provide to our employees. A positive environment for the manager, drivers and maintenance staff to identify and address concerns in a timely fashion. An “open door” to ask and answer questions, resolve issues, offer suggestions on ways to improve safety and efficiency. Compliance with all DOT, Federal, State and local regulations, with a stringent DOT Drug and Alcohol testing program. Required daily pre- and post-trip bus logs to record vehicle defects. Regular driver meetings with subjects relating to school bus safety, communication, defensive driving, emergency and first-aid procedures, and other timely topics that arise. An annual “start of school kick-off” in service for all employees to review routes and bus assignments and, featuring relevant topics, such as school district policies, managing student behavior, improving communication, defensive driving, etc. Our team of talented and enthusiastic Johnson School Bus drivers at the Horicon location. Johnson Bus takes great effort to maintain a safe, reliable fleet of vehicles. This is evident by the consistently high approval ratings issued by the Wisconsin State Patrol in its annual school bus inspections. Wisconsin DOT Annual State Patrol Inspection. In August 2012, the U.S. DOT awarded Johnson Bus a "Satisfactory" safety rating in our most recent audit. This is the highest rating available.